Grace Peterson is a writer and blogger living in Oregon. 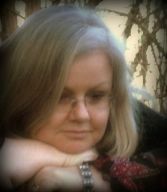 Her stories have been published in several anthologies and she blogs about the writing craft and recovery topics. 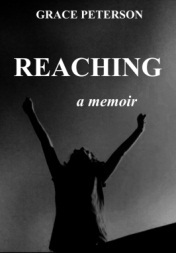 Grace’s new memoir, Reaching has just been published by All Things That Matter Press. It tells her tale of entering and leaving a religious cult and breaking free from the power of a charismatic cult leader. An avid gardener, Grace keeps busy writing a garden column, updating her garden blog and working on her forthcoming gardening book. What interested you in contributing to Beyond Belief? It began with serendipity and a random Google search. When I found Susan and Cami’s website and read their call for submissions I immediately thought, well, this is right up my alley! Having someone interested in my journey was and is a priceless gift. What was it like to revisit your experience of living within extreme religion? It made me very grateful for where I am today. I was an emotional wreck during the bulk of my seven years under the influence of a hyper-religious man I call “Brock.” During that time, opportunities to explore my emotions were far and few between. I had convinced myself that seeking outside help was wrong. I was like a caged animal. If my “free expression” wasn’t congruous with Brock’s point of view, I was either a rebel or demon possessed. I felt terribly hopeless. What was the hardest part of leaving for you? I remember thinking, if leaving Brock means leaving God then, so be it. I really didn’t want to live the rest of my life without God but I didn’t want to live under Brock’s control either. Brock had taught me to fear the outside world. It took 5 years before I could start to trust people. During this time I began to realize that what I had believed was wrong. I had to admit my part in it. It was much easier to lay blame on Brock and play the victim. It took several years and lots of therapy to own up to the role I played in my own deception. Why do you think modern day women are attracted to extreme religion? For me, initially it was about finding a cure for what was ailing me. Once I was in it became about belonging. I had grown up with parents who were emotionally unavailable. I was longing for connection and wanted a family, particularly a doting father. I believe all of us need to feel a human connection. We’re on this earth for a united purpose. What do you still carry with you from your religious life? Not very much, I pray, not in a ceremonial way. I talk to God and hope that a higher benevolent being cares about me and my loved ones and the goodness of humanity. I hold on to the hope that when we’ve exhausted our efforts to control things, we can trust that higher power to guide us. I’m not a religious person. I doubt I’ll ever step foot in a church again. What advice do you have for women who are struggling with their faith now? Extreme religion is all about conformity to a specific set of doctrines. I would remind women who are struggling with their faith to hone their intuition. We’ve all been gifted with the ability to think and reason and wrestle, to discover what works and what doesn’t. Additionally I’d remind women that we can eschew religious people and/or institutions and still be connected to our higher power. We don’t need a bevy of pious people to guide us. We can think for ourselves. One last thought: A belief system that is hurting you emotionally, physically or spiritually is a red flag. Even if you can’t put your finger on what it is, listen to your gut. It’s okay to think the unthinkable—and to protect yourself from situations that are hurting you. What are your current writing projects? My memoir Reaching was just published. In it, I go into much more detail about my life, how I was lured into a cult and how I got out. I’ve also written a light-hearted garden book which will be released in late fall 2013. I write a garden column and author two blogs. Anything else you’d like to say to our readers? I’d like to state publicly how honored I am to be a part of such an important undertaking. Thank you Susan, Cami and Seal Press for believing in this project and giving each contributor a platform to share their story. This entry was posted in Interviews and tagged Beyond Belief, christian cults, feminism and religion, fundamentalist religion, grace peterson, leaving a cult, leaving religion, women and religion. Bookmark the permalink. Many thanks to Grace for your clarity, compassion and honesty concerning a difficult subject. Grace, This interview has piqued my interest even more. REACHING is next on my reading list and I can’t wait to dig in. Congratulations! It sounds like a gripping story that will help many others. So stoked for you Grace…such an inspiration!! The advice you give on “listening to your gut” is excellent. It also took me a long time to realize I didn’t need anyone else to intervene for me with any divine power…we each have that capability if we choose to seek and find it. You are an inspiration Grace!